12 Red Roses Vase. with Assorted Cadburys Chocolate. 12 Red Roses Vase with Three Colourful Balloons, Teddy. 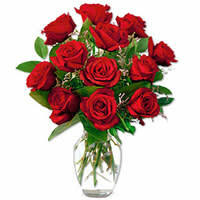 12 Red Roses in a Vase with 500 grms Assorted Sweets. 12 Red Roses in a Vase with 16 pics Ferrero Rocher chocolate box.